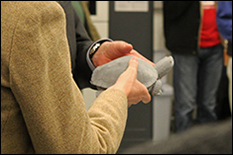 On Thursday, Feb. 5, more than 120 3D printing and additive manufacturing experts across industry, government and academe gathered at the University of Maryland (UMD) Startup Shell for a 3D Maryland Expert User Group Meeting to see firsthand examples of how Maryland has become a major hub for companies specializing in these revolutionary technologies. Supporting 3D Maryland’s mission to increase awareness of the competitive advantages 3D printing and additive manufacturing technologies offer, UMD A. James Clark School of Engineering researchers offered an inside look at how 3D printing has transformed the field of engineering, specifically aerospace, bioengineering and mechanical engineering. The event – 3D Maryland’s largest Expert User Group meeting to date – featured presentations from Alison Flatau, Department of Aerospace Engineering (AE) Professor and Associate Dean for Research, Shing Shin Cheng, Department of Mechanical Engineering (ME) graduate student, Adam Hsieh, Fischell Department of Bioengineering (BioE) Associate Professor and Associate Chair, and Jim Zahniser, University of Maryland Executive Director of EIT. The presentation slides are now available for download. Flatau demonstrated how – in short time – 3D printing has had an enormous impact on the fields of bioengineering and aerospace engineering. Using 3D scanning technology and 3D printing, Flatau is working with BioE students who are designing custom-fit protective sleep masks for glaucoma patients to minimize pressure on the face that could otherwise increase a patient’s risk of blindness. In addition to her work with BioE, Flatau’s work in aerospace engineering often involves 3D printed materials. Among the countless 3D devices used in aircraft today are rotors, landing gear joints, and fuselage frames, Flatau noted. 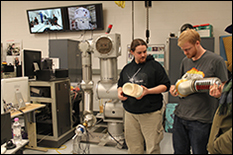 “UMD students have access to fabulous resources and opportunities in 3D printing, and we are thrilled to invite those involved in the 3D printing and additive manufacturing industries to check out our facilities,” she said. A member of ME Professor Jaydev Desai’s UMD’s Robotics, Automation, and Medical Systems (RAMS) Laboratory, Cheng showed examples of how RAMS is working with University of Maryland School of Medicine colleagues, J. Marc Simard and Rao Gullapalli, to develop small-scale robots capable of removing hard-to-reach brain tumors. One of the key challenges in the design is the fact that the robots must be small enough to be minimally invasive. “We envision that the entire neurosurgical process can be performed in an MRI room by robots, under the supervision of a neurosurgeon who is sitting in the MRI control room,” Cheng explained. By replacing normal vision with continuously updated MRI, the surgeon is able to visualize deep-seated tumors and monitor the robot’s movement, without the need for a large incision in the brain. To work toward achieving this goal, the research team used 3D printing to build a prototype with VeroWhite, an MRI-compatible plastic material. Further demonstrating how 3D printing has transformed the world of bioengineering, Hsieh demonstrated how he and fellow UMD researchers are using 3D printing materials to address the needs of patients with musculoskeletal disorders. 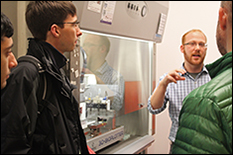 Following the presentations, attendees split into groups to tour four of UMD’s engineering laboratories that utilize 3D printing technology: the Rapid Prototyping Laboratory, the Tissue Engineering & Biomaterials Laboratory, the Nanocenter FabLab, and the Space Systems Laboratory. This event was co-sponsored by the A. James Clark School of Engineering, the Fischell Department of Bioengineering – part of the Maryland Center of Excellence in Regulatory Science & Innovation (M-CERSI), Startup Shell, and the University of Maryland Office of Corporate and Foundation Relations. 3D Maryland is an initiative of the Howard County Economic Development Authority and the Maryland Center for Entrepreneurship. Funded through a grant from Howard County, it is designed to help build and maintain connections among producers, while fostering innovation in the 3D printing and rapid prototyping industries.